Prosciutto-Wrapped Figs with Cheese. Cut figs in half and stuff with blue cheese, goat cheese or gorgonzola. Wrap with prosciutto. Grill on medium to high heat for approximately 2 minutes per side, until the prosciutto gets a little crispy and the cheese is warm. Drizzle with olive oil and serve. Figs with Ricotta and Honey. Slice your figs down the middle but not all the way through. Stuff with fresh ricotta, drizzle with honey and garnish with chopped nuts and a sprig of mint. Figs are also great in salads, pastas and baked desserts. Share some of your favorites in the comments! Wash your kale. 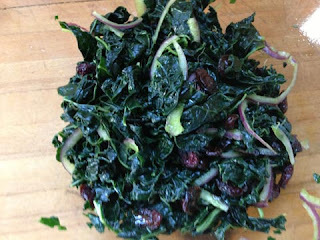 If you placed your onion and cranberries on top of your unwashed kale for a photo, wash them too. 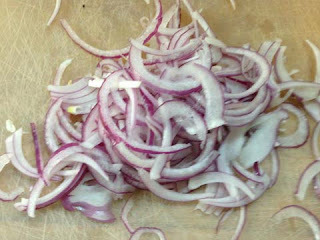 Thinly slice your onion. I rely on a mandoline for this, but if you're handy with a knife, that works too. 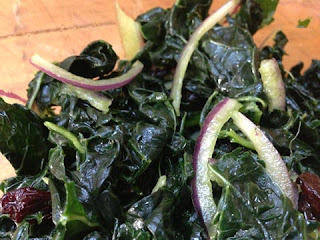 I think thinly sliced onion is salad's best friend, kale or otherwise. 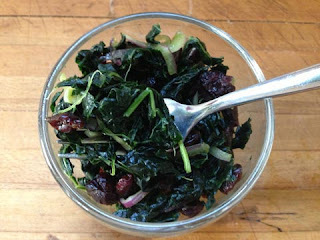 Greens that have spent quality time in the fridge with thinly sliced onion don't need much in the way of dressing. They're ready. Get some salt. This is kind of a lot of salt. 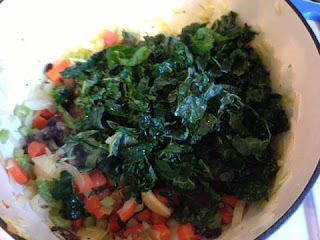 I used a little more than half a teaspoon for a bunch of kale (two hearty servings). This gets drained so you're not ingesting all of it, but you need a good bit to start with. 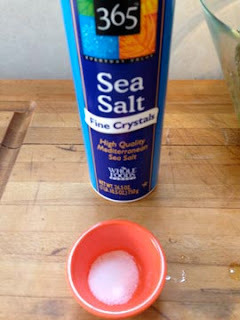 I prefer to use sea salt or other coarse salt - this is "fine," but it's coarser than table salt. 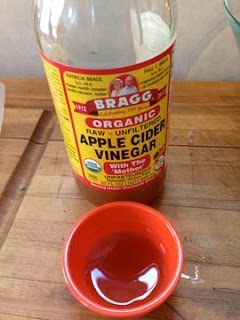 Get some vinegar or lemon juice. I usually go with lemon juice, but last week I tried vinegar and it worked really well, so I'll bring that into the rotation. About two tablespoons. Add that to your salad. This salad is in a clear bowl, but I think it looks like it's levitating. Kale salad is wonderful, but perhaps not magic. Now massage it. The vinegar (or lemon juice) and salt will tenderize it. With your bare hands - checking first for papercuts and hangnails, what with the vinegar and all - tear it up, twist it, wring it out, and generally mush it around. 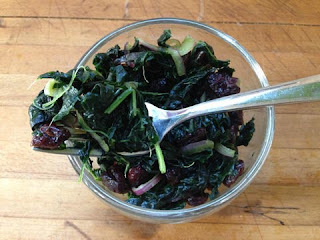 Spend 3-5 minutes on this per bunch of kale (last week's four-bunch salad required a tag team effort). 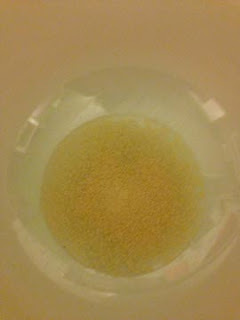 As you're doing this, green liquid will pool at the bottom of your bowl, as illustrated in the blurry photo below. This is your friend. Rub the kale into the liquid. Wring out the kale. Rub it into the liquid again. Your kale will radically decrease in volume. 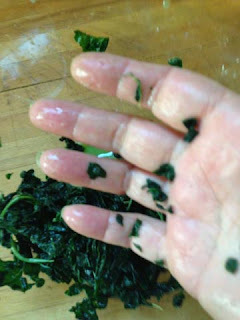 Your fingernails will turn green. 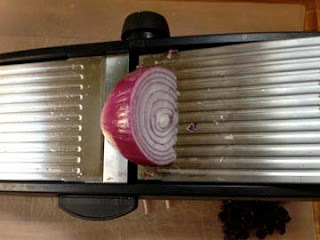 Add in your cranberries (a cup or so per bunch) and onions (a quarter of a red onion, sliced very thin). Toss that together and stick it in the fridge. Let it chill with that green liquid for at least an hour, but overnight is really best. 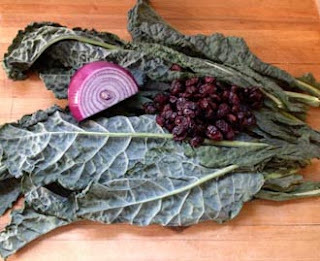 After a while in the fridge the kale will be more tender, the onions will be more mild (and greenish), and the dried cranberries will have plumped a bit and be softer. Drain off the remaining green liquid. You can serve it as is, or dress it like any other salad. I like to use strawberry balsamic dressing and candied walnuts. 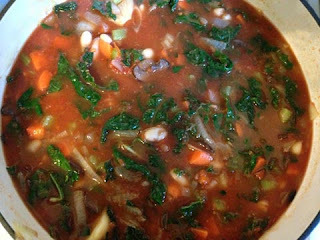 This recipe is cross-posted at SaturdaysMouse.com where I’m working on making food out of food. Wash and destem the kale. 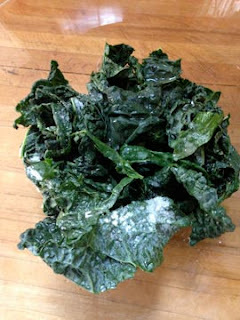 Add salt and vinegar and massage for 3-5 minutes, tearing the kale as you go. 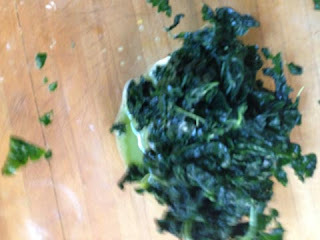 Kale will decrease in volume and green liquid will gather in the bowl. 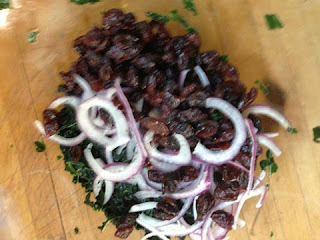 Add cranberries and onions, toss vigorously and refrigerate for at least an hour, overnight is best. Drain and serve, as is or dressed. Garlic hummus is one thing, roasted garlic hummus is entirely another. The garlic flavor is milder, nuttier, and more distributed throughout the hummus. There aren't tiny bits of garlic throughout, rather some of the creamy goodness is chickpeas and some of the creamy goodness is garlic, and the flavor is deep and rich and integrated. This is just better. First, roast your garlic. 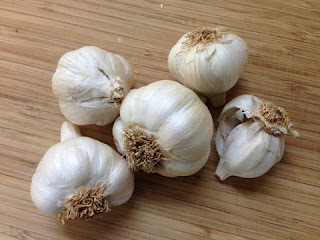 I'm making a little over two cups of hummus and using 5 small heads of garlic. This is a lot. Use less, unless you love garlic. 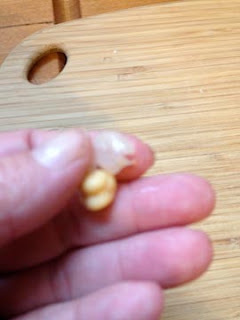 My garlic is old. My garlic is not bad, but it's not super fresh either. So my garlic has green sprouts. Some people argue strongly that you need to remove these because they're bitter. Some people say that you need to remove these because they're tough. I don't listen to those people, but if you're particularly sensitive to this, go ahead and remove any green sprouts. Otherwise, just use your garlic. 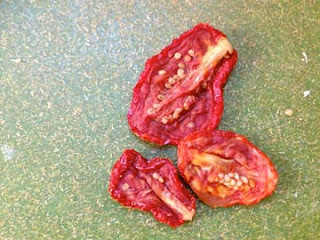 Cut into each head to expose all the cloves, spritz with olive oil and either place in a tiny covered container or wrap with alumnum foil. Roast at 400 for an hour or so until the cloves are brown and soft and sweet and nutty. Set aside to cool. I know, you're saying to yourself, "That's a lot of wasted garlic!" To which I say no. We don't waste garlic. You're looking at a woman with a freezer full of bread ends and mushroom stems and brown bananas. 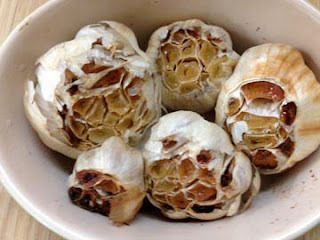 Pick your garlic ends out of their papery shell and freeze them. They'll be a bit milder when they're defrosted but still perfect for mincing into whatever dish you're making. 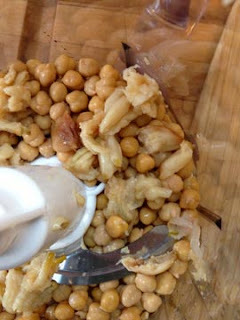 Either you've soaked and cooked some chickpeas or you've opened a can or box of garbanzos. I like these because I don't have to worry about the can...and if you're not worried about cans, I suggest you don't Google and go on your merry way eating out of cans without the bat of an eye. We have too much to worry about. Peel your chickpeas. This is tedious, sure, but so is eating gritty hummus. Peeling one chickpea is fun. By the 50th chickpea it's not so much. 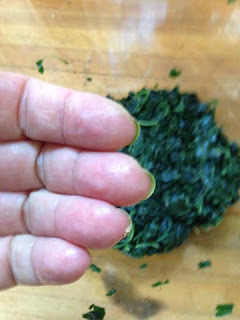 Pinch it between your forefinger and thumb and shoot it into a bowl, retaining the skin between your fingers. Make gun noises. Until that gets old. Rub a handful between two open palms and separate the skins from the chickpeas. Fill a bowl with water and chickpeas. 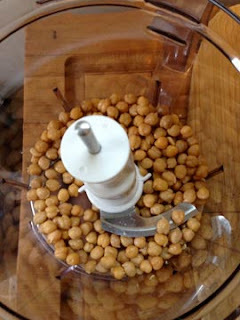 Assault the chickpeas underwater to loosen the skins and then skim the surface of the water for floating skins. There are several ways to do this. I promise it's worth it. I think naked chickpeas look like tiny turkeys. Picture a turkey on the scale of a Lego minifig. If your Lego men and women have a kitchen, a chickpea would be their turkey. Now you're almost done. 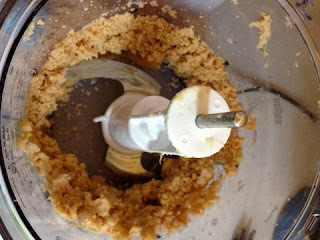 Chickpeas and garlic go into a food processor or your little as-seen-on-tv chopper or your million-dollar blender. Add your garlic. This is an impossible to photograph process, because your hands will be sticky with garlic. First, make sure your garlic is cool enough to touch. Then squeeze it out of it's papery shell into your food processor. This is fairly icky, but it's worth it. Give that a whir in the processor. Here's a secret...a lot like my carrot secret... I don't love tahini. As much as I love peanut butter and sunflower seed butter, I don't love tahini. I also don't want my hummus to taste like peanut butter or sesame paste. 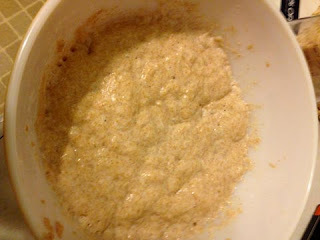 So I don't use as much tahini as the other recipes in the world call for. It's ok. If you love tahini, you could add more of that and less olive oil. It's on you. A quarter cup of tahnini and a quarter cup of olive oil is a good start. The juice of a lemon. Give that a whir together until it's all incorporated. Now season. Salt. Cayenne. Maybe some onion powder. Chives. Whatever pleases you. I hold to my belief that onion powder is an entirely different food than onion. 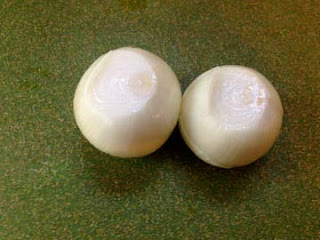 Onion powder has an ability to pull a dish together much in the way that salt lets you taste it. But lots of "real" cooks out there tell us that if we're using dried spices we aren't really cooking. Don't listen. This is really cooking. Ok, no heat, but still. Preparing. Either way, start light, especially on salt, and build. Give it a whir and ask yourself if it needs more. Give it another whir. At this point, if you're like me, you have delicious, smooth hummus that's a bit too thick. Water time. Add a couple tablespoons and whir. How's it doing now? 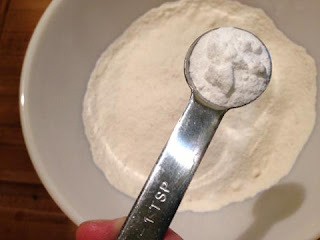 Ok, add another tablespoon. What's it like? 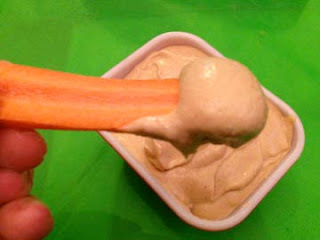 Keep going until you have super smooth creamy hummus in the thickness you prefer. I like it pretty thin, but not runny. It thickens and the flavor intensifies a bit as it sits in the fridge. To roast garlic: Preheat oven to 400. 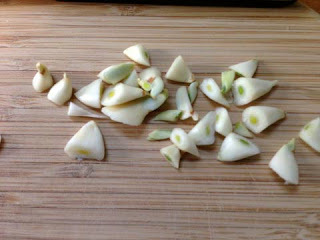 Slice ends off heads of garlic to expose cloves. Spritz with olive oil. 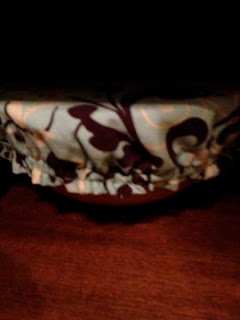 Roast in small dish with a lid or wrapped in aluminum foil for an hour until brown and soft. Set garlic aside to cool. 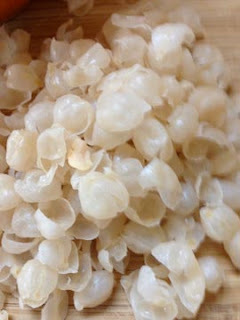 Peel chickpeas either by shooting them out from between thumb and forefinger, rubbing between hands or another method. Discard skins. 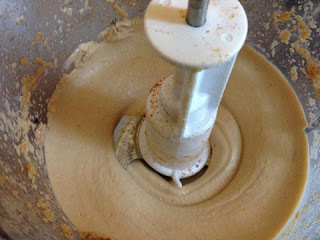 Add chickpeas to food processor, fancy blender or little chopper. Squeeze garlic in. Blend until chopped finely. 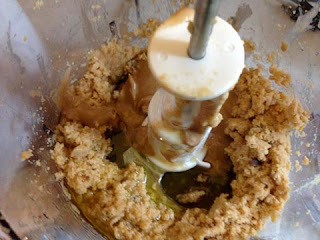 Add olive oil and tahini. Blend. Add salt, lemon and cayenne. Blend more. 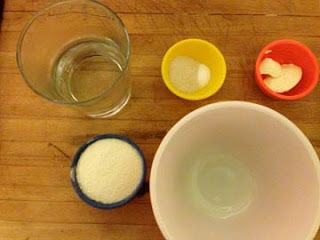 Add water by the tablespoon, blending in between until desired consistency. 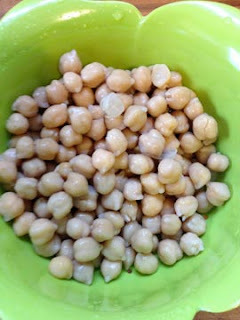 If using cooked dried chickpeas, use cooking liquid instead. Hummus is one of those foods that I had never thought of making on my own, until one day I did, I was shocked at how quickly it came together. 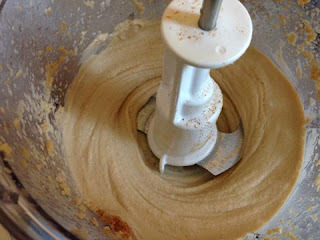 Other than causing me to purchase tahini, which I really had no other use for, hummus is simple. Average hummus is simple. Ok hummus is simple. But you can do better too. 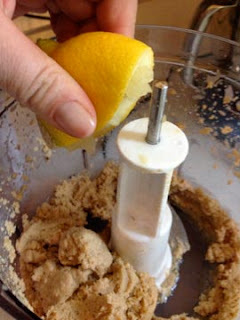 Chickpeas, tahini, lemon, oil, water, garlic, salt, processor. That's all you need. Garlic hummus is one thing, roasted garlic hummus is entirely another. The garlic flavor is milder, nuttier, and more distributed throughout the hummus. There aren't tiny bits of garlic throughout, rather some of the creamy goodness is chickpeas and some of the creamy goodness is garlic, and the flavor is deep and rich and integrated. This is just better. Garlic. First, roast your garlic. 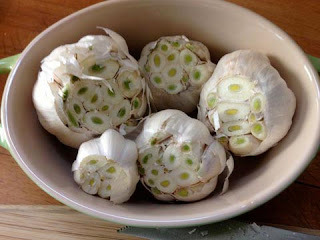 I'm making a little over two cups of hummus and using 5 small heads of garlic. This is a lot. Use less, unless you love garlic. My garlic is old. My garlic is not bad, but it's not super fresh either. So my garlic has green sprouts. Some people argue strongly that you need to remove these because they're bitter. Some people say that you need to remove these because they're tough. I don't listen to those people, but if you're particularly sensitive to this, go ahead and remove any green sprouts. Otherwise, just use your garlic. Cut into each head to expose all the cloves, spritz with olive oil and either place in a tiny covered container or wrap with alumnum foil. Roast at 400 for an hour or so until the cloves are brown and soft and sweet and nutty. Set aside to cool. I know, you're saying to yourself, "That's a lot of wasted garlic!" To which I say no. We don't waste garlic. You're looking at a woman with a freezer full of bread ends and mushroom stems and brown bananas. 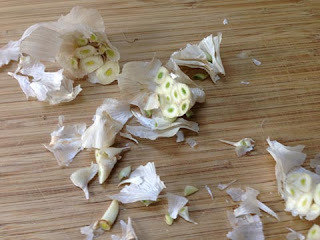 Pick your garlic ends out of their papery shell and freeze them. They'll be a bit milder when they're defrosted but still perfect for mincing into whatever dish you're making. Chapter Two: Chickpeas. 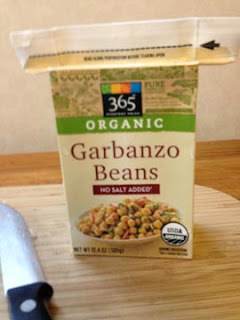 Either you've soaked and cooked some chickpeas or you've opened a can or box of garbanzos. I like these because I don't have to worry about the can...and if you're not worried about cans, I suggest you don't Google and go on your merry way eating out of cans without the bat of an eye. We have too much to worry about. Peel your chickpeas. This is tedious, sure, but so is eating gritty hummus. Peeling one chickpea is fun. By the 50th chickpea it's not so much. Pinch it between your forefinger and thumb and shoot it into a bowl, retaining the skin between your fingers. Make gun noises. Until that gets old. Rub a handful between two open palms and separate the skins from the chickpeas. Fill a bowl with water and chickpeas. 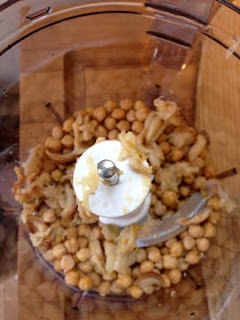 Assault the chickpeas underwater to loosen the skins and then skim the surface of the water for floating skins. There are several ways to do this. I promise it's worth it. 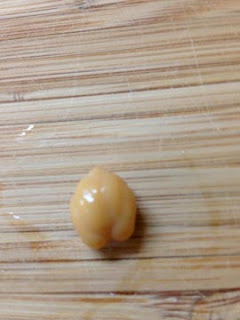 I think naked chickpeas look like tiny turkeys. Picture a turkey on the scale of a Lego minifig. If your Lego men and women have a kitchen, a chickpea would be their turkey. Now you're almost done. 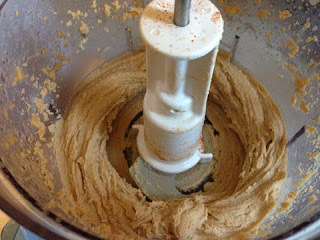 Chickpeas and garlic go into a food processor or your little as-seen-on-tv chopper or your million-dollar blender. 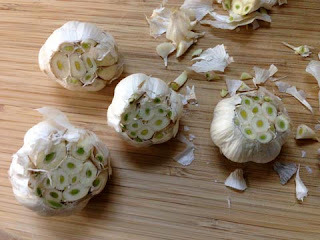 Add your garlic. This is an impossible to photograph process, because your hands will be sticky with garlic. First, make sure your garlic is cool enough to touch. Then squeeze it out of it's papery shell into your food processor. This is fairly icky, but it's worth it. Give that a whir in the processor. Here's a secret...a lot like my carrot secret... I don't love tahini. As much as I love peanut butter and sunflower seed butter, I don't love tahini. I also don't want my hummus to taste like peanut butter or sesame paste. 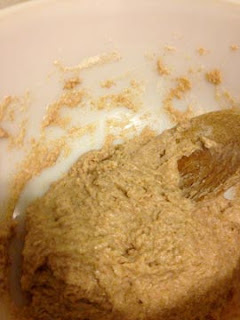 So I don't use as much tahini as the other recipes in the world call for. It's ok. If you love tahini, you could add more of that and less olive oil. It's on you. A quarter cup of tahnini and a quarter cup of olive oil is a good start. The juice of a lemon. Give that a whir together until it's all incorporated. Now season. Salt. Cayenne. Maybe some onion powder. Chives. Whatever pleases you. I hold to my belief that onion powder is an entirely different food than onion. 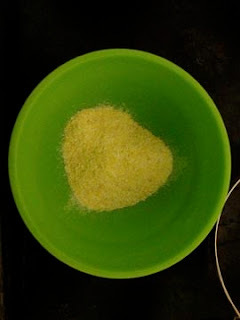 Onion powder has an ability to pull a dish together much in the way that salt lets you taste it. But lots of "real" cooks out there tell us that if we're using dried spices we aren't really cooking. Don't listen. This is really cooking. Ok, no heat, but still. Preparing. Either way, start light, especially on salt, and build. Give it a whir and ask yourself if it needs more. Give it another whir. At this point, if you're like me, you have delicious, smooth hummus that's a bit too thick. Water time. 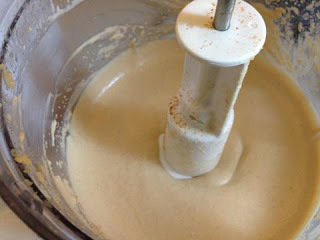 Add a couple tablespoons and whir. How's it doing now? Ok, add another tablespoon. What's it like? 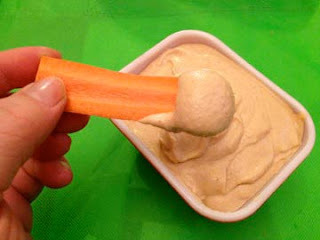 Keep going until you have super smooth creamy hummus in the thickness you prefer. I like it pretty thin, but not runny. It thickens and the flavor intensifies a bit as it sits in the fridge. Lately, I've just been sticking cranberries into everything I cook. I really miss fruit this winter, and I got tired of apples pretty early on. 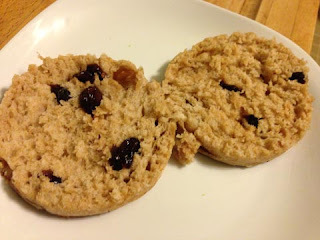 You could make this without the cranberries, but then I'd have nothing to contribute to the literature, because there already is a perfect recipe for English muffins. I've been trying to do this for a while. I hinted at it 14 months ago (!) It turns out that everyone uses the same recipe anyway, and it's Alton Brown's. 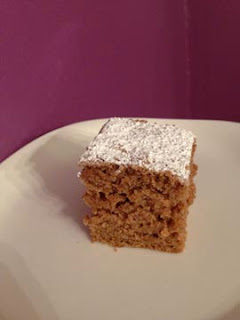 "My" recipe is *so* Alton Brown's that I'm not going to post it at the end, really, this is someone else's work. The only changes I made were: 1. Cranberries! 2. Earth Balance instead of shortening 3. Equal parts whole wheat and AP flour When I say everyone uses Alton Brown's recipe, I mean that most of the first page of Google hits on "English Muffin Recipe" is either that version or something based on that version. I mean that when I searched for video guidance on making English muffins, the most useful video is based on Alton Brown's recipe. Also, I've made English muffins not using Alton Brown's recipe and they were less than awesome. These, however, are awesome, so let's do it this way. I made five muffins using the aforementioned recipe, cut in half. Really, I should have made four muffins using that much dough, and so my muffins are not perfectly round, but otherwise, it's a win. 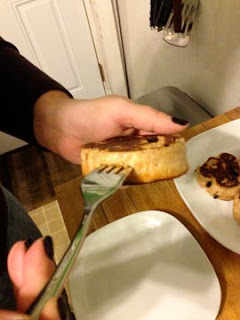 This recipe involves special equipment - English muffin rings. 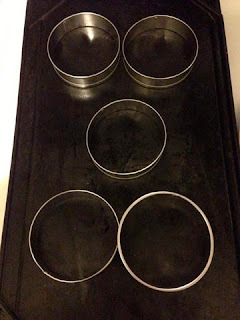 [caption id="" align="aligncenter" width="240"] Four of these are "English Muffin Rings" and one is an off-label use of my largest biscuit cutter. [/caption] Sure, you don't have that. Who does? I do, because I finally gave in and bought them ($4.99) after trying to create my own rings out of aluminum foil. They did not hold up. If you're open to various muffin sizes, you can use biscuit cutters or any other sort of ring you have floating around in your cabinet. The internet says that you can open both sides of a tuna can and use that in lieu of actual rings, but I don't eat cans of tuna and I don't believe a can of cat food can ever truly be clean enough to eat out of. The other thing that held me back, even though I first read this recipe a year and a half ago, was dry milk. That's not something I keep around, in fact it's not something I've ever purchased. It's something I was served disolved into lukewarm water the 1990s during a foreign exchange trip to Europe and I've not held it in high regard since. Also, it's pricey. But after wrestling with other recipes, it was the way to go. I mentioned a video based on the same recipe - I took some tips from that as well and it's pretty well done so if you're making these for the first time, why not check it out? I don't know this person, it's just a useful video. Let's do this then. Remember, I cut my recipe in half and tried to get five muffins out of it, but I think you can get a solid 8 out of a full recipe or 4 out of a half. These freeze great, but I do fork-split them first. It's water (divided), flour, yeast, Earth Balance (instead of shortening, but your fat of choice), sugar, salt, and nonfat dry milk. The original recipe is all white flour, but half AP and half whole wheat still gives you a nice texture. Chewy. Crisp on the bottom. Not too heavy. Also, dried cranberries. I added a third of a cup for a half batch. Oh yeah, also cornmeal. This is why I don't usually try to set everything out ahead of time. I'm going to forget something. And some oil (not pictured). I used safflower, but whatever you like. First thing, melt that margarine. 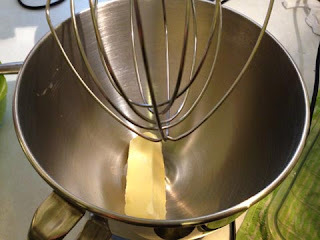 Hot water, margarine (shortening, whatever) salt, sugar and dry milk go into a bowl and get a whisking. Do this first so it has a chance to cool. Then get your yeast going. Warmish water (body temp), a pinch of sugar or drop of honey and your yeast. Mix a bit and let it froth. 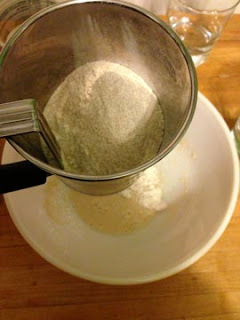 Once your milk/margarine mix is coolish and your yeast is frothy, sift your flour in and mix it all together. Hold off on the cranberries for now. 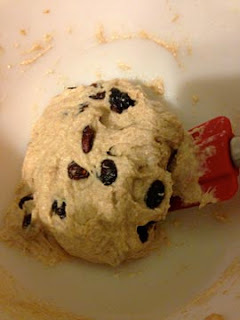 Mix well, cover your dough and set it to rise in the nice warm spot in your house where you set things to rise. Let it go for an hour. Alton Brown says half, but I like an hour. It all depends on the temperature anyway. It didn't quite double, but it loosened up and got airy. It's a pretty sticky dough. Fold in your cranberries. 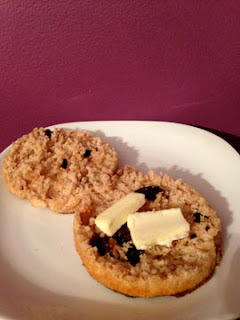 Preheat your griddle and your muffin rings on med-low. 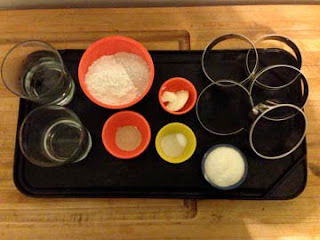 Add a smidgen of oil to each ring - maybe a tablespoon total among your four (in my case five) rings. Sprinkle the griddle with cornmeal inside each ring. Divide your dough among your rings. 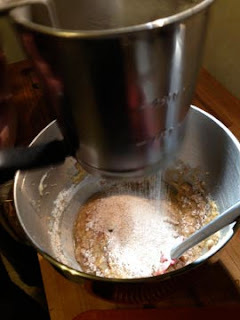 Alton Brown advises using two scoops with a #20 ice cream scoop. I don't know about you, but I haven't had my ice cream scoop calibrated recently. Do what you will. Notice how mine aren't quite full? This is why you should use four rings. 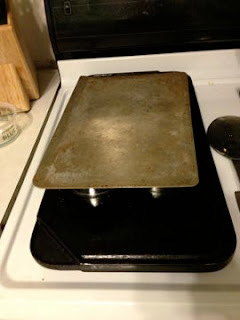 Cover with a cookie sheet or other flat piece of metal. 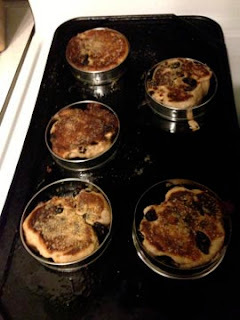 Let them cook six minutes (you'll hear them sizzling) then remove the cookie sheet and flip the muffins. Another 5-6 six minutes and you have English muffins. Cool on a baking rack. And split with a fork. They're good as is, but better toasted. And buttered. The cranberry goodness would go well with some orange marmelade, if you have that handy. I did not. Seal them up in something airtight or split and freeze. The whole thing takes less than an hour and a half, so homemade English muffins aren't a serious chore, but English muffins you've already made and set aside for later, those are fantastic. This is cross-posted at SaturdaysMouse.com where I’m working on making food out of food. I made five muffins using the aforementioned recipe, cut in half. Really, I should have made four muffins using that much dough, and so my muffins are not perfectly round, but otherwise, it's a win. 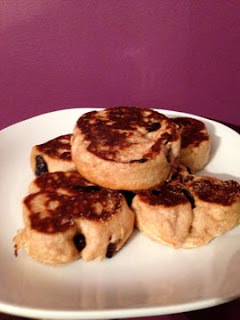 This recipe involves special equipment - English muffin rings. Four of these are "English Muffin Rings" and one is an off-label use of my largest biscuit cutter. Sure, you don't have that. Who does? I do, because I finally gave in and bought them ($4.99) after trying to create my own rings out of aluminum foil. They did not hold up. If you're open to various muffin sizes, you can use biscuit cutters or any other sort of ring you have floating around in your cabinet. The internet says that you can open both sides of a tuna can and use that in lieu of actual rings, but I don't eat cans of tuna and I don't believe a can of cat food can ever truly be clean enough to eat out of. The other thing that held me back, even though I first read this recipe a year and a half ago, was dry milk. That's not something I keep around, in fact it's not something I've ever purchased. It's something I was served disolved into lukewarm water the 1990s during a foreign exchange trip to Europe and I've not held it in high regard since. Also, it's pricey. But after wrestling with other recipes, it was the way to go. I mentioned a video based on the same recipe - I took some tips from that as well and it's pretty well done so if you're making these for the first time, why not check it out? I don't know this person, it's just a useful video. Let's do this then. Remember, I cut my recipe in half and tried to get five muffins out of it, but I think you can get a solid 8 out of a full recipe or 4 out of a half. These freeze great, but I do fork-split them first. It's water (divided), flour, yeast, Earth Balance (instead of shortening, but your fat of choice), sugar, salt, and nonfat dry milk. The original recipe is all white flour, but half AP and half whole wheat still gives you a nice texture. Chewy. Crisp on the bottom. Not too heavy. Also, dried cranberries. I added a third of a cup for a half batch. Oh yeah, also cornmeal. This is why I don't usually try to set everything out ahead of time. I'm going to forget something. And some oil (not pictured). I used safflower, but whatever you like. First thing, melt that margarine. 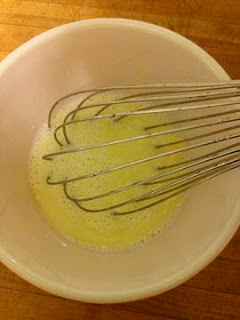 Hot water, margarine (shortening, whatever) salt, sugar and dry milk go into a bowl and get a whisking. Do this first so it has a chance to cool. Then get your yeast going. 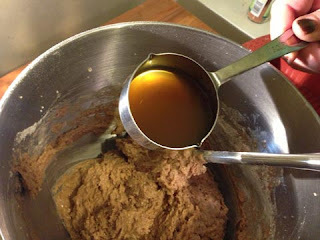 Warmish water (body temp), a pinch of sugar or drop of honey and your yeast. Mix a bit and let it froth. 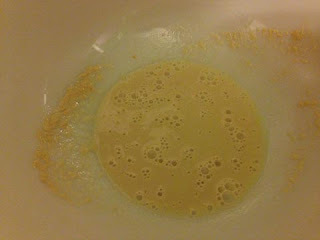 Once your milk/margarine mix is coolish and your yeast is frothy, sift your flour in and mix it all together. Hold off on the cranberries for now. 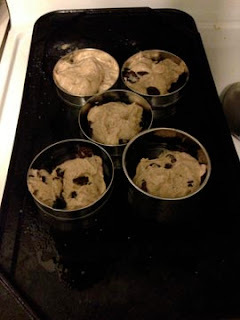 Mix well, cover your dough and set it to rise in the nice warm spot in your house where you set things to rise. Let it go for an hour. Alton Brown says half, but I like an hour. It all depends on the temperature anyway. It didn't quite double, but it loosened up and got airy. It's a pretty sticky dough. Fold in your cranberries. Preheat your griddle and your muffin rings on med-low. 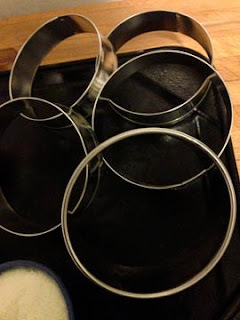 Add a smidgen of oil to each ring - maybe a tablespoon total among your four (in my case five) rings. 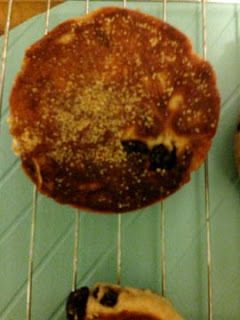 Sprinkle the griddle with cornmeal inside each ring. Divide your dough among your rings. 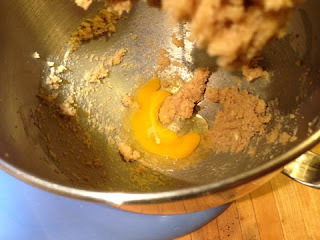 Alton Brown advises using two scoops with a #20 ice cream scoop. I don't know about you, but I haven't had my ice cream scoop calibrated recently. Do what you will. Notice how mine aren't quite full? This is why you should use four rings. 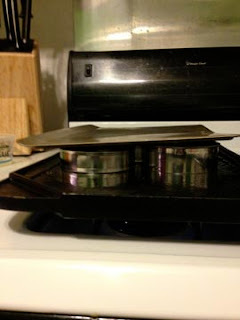 Cover with a cookie sheet or other flat piece of metal. Let them cook six minutes (you'll hear them sizzling) then remove the cookie sheet and flip the muffins. Another 5-6 six minutes and you have English muffins. And split with a fork. They're good as is, but better toasted. And buttered. The cranberry goodness would go well with some orange marmelade, if you have that handy. I did not. Seal them up in something airtight or split and freeze. The whole thing takes less than an hour and a half, so homemade English muffins aren't a serious chore, but English muffins you've already made and set aside for later, those are fantastic. This is cross-posted at SaturdaysMouse.com where I’m working on making food out of food. I used sundried tomatoes in place of bacon or pancetta. I don't believe I'll every fully wrap my head around the concept of umami, but tomato and mushrooms do well subbing for meat. I chopped up the sundried tomatoes and swished them around in two tablespoons of oil over a medium flame until they had softened a bit and smelled like they were ready to make soup. You know how that smells, right? Next, the veg. 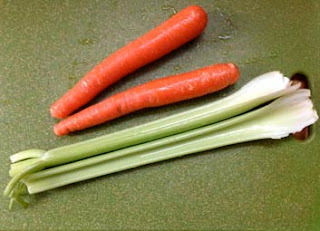 A couple of carrots and celery stalks, and two small onions, all diced up. An entire head of kale. 4 cups of cannellini beans. A quart of crushed tomatoes. 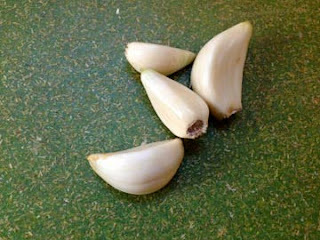 Four cloves of garlic. A cup of sliced mushrooms. 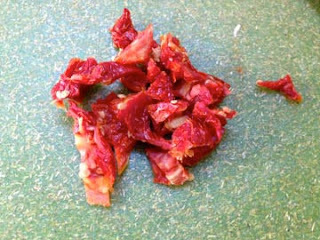 I tossed the onion with the sundried tomato until it was translucent and glossy. Diced carrot and celery went in, then I minced in the garlic. About 5 minutes later, when the celery was just starting to yield, I added a bunch of chopped lacinato kale (stems removed). This doesn't need to be kale. 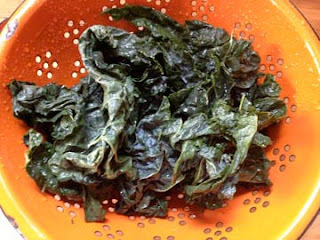 Lots of recipes call for escarole, or cabbage, but spinach or chard would work well. 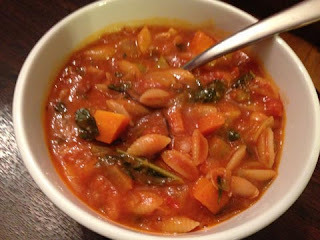 Minestrone is whatever you need it to be. 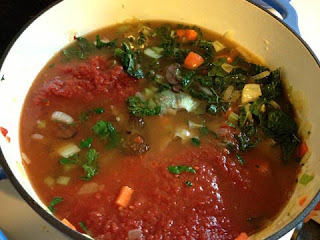 I flipped the kale around with the other veg for a few minutes until it was starting to wilt, then turned the whole thing into soup. This would be a good time to add diced potatoes or squash, if you have them on hand. I added 6 cups of vegetable stock (you can use chicken or beef here) and four cups of crushed tomatoes. If you'd like to add pasta to your soup, think about maybe using 8 cups of stock. This is a substantial soup and you'll need extra liquid to support some cavatelli or ditalini. Give that a stir and add in the beans. 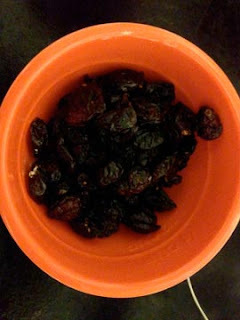 If you're using dried beans (and you should use dried beans) soak and cook them in advance. 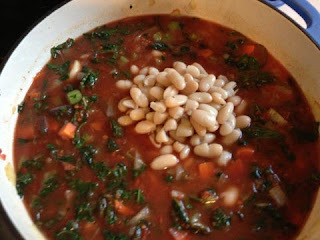 If you're using canned beans (and I used canned beans), give them a serious rinse to reduce the salt. Add herbs. Again, this is flexible. I had oregano in the freezer and added about a tablespoon and a half of those leaves, plus about half a tablespoon of both dried thyme and rosemary. Fresh is best, so if you have it, use about a tablespoon of fresh herbs for each teaspoon of dried - that's 3x as much fresh as you'd have used dried - because dry herbs are all compact and crumbly. Salt and pepper. I salt my soups more than I salt my other foods, but I'm generally conservative with salt. 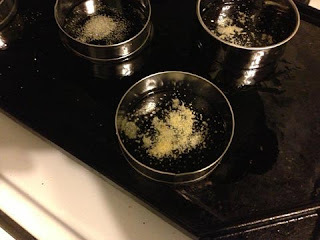 If you use storebought stock, it's probably already salted, so salt carefully. Salt, taste, and salt some more. With canned tomato products, I find that there is a bit of a metallic taste that is reduced by adding salt. If your tomatoes are fresh or boxed, you may not run into this. Once my soup was seasoned, I brought it up to a boil, then back down to a simmer and let it cook like that, barely bubbling, for 45 minutes. You want to make sure you end up with tender kale, but if you use softer greens, you can probably get away with a 30 minute simmer. Either way, that's pretty quick for soup. 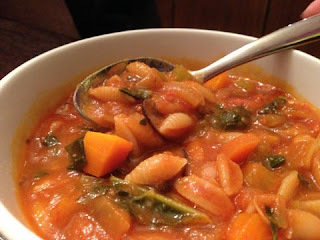 In the end, I had about three quarts of soup, so I could stash two right in the freezer. A few notes about adding pasta. This soup turns into an amazingly filling meal with a bit of pasta. I used cavatelli. I only added pasta to the soup we were eating immediately, so the rest of it was frozen pasta-free. It's very easy to add pasta when you reheat it, and that way you don't have to worry about mushy noodles. So I had added a couple of extra cups of stock to my soup early on, and just dropped in a small handful of pasta per serving. Brought that to a low boil until the pasta was cooked to my liking, and I was all set. If it's too thick, just add more stock. 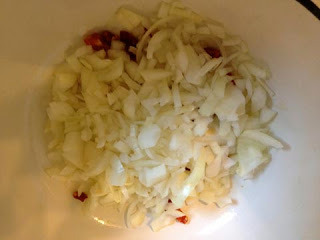 Sauté onion with the sundried tomato until translucent. 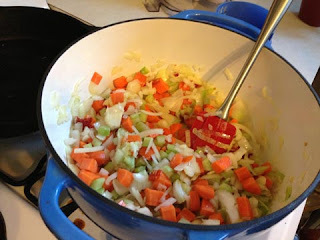 Add carrot, celery and minced garlic and sauté for 5 minutes. 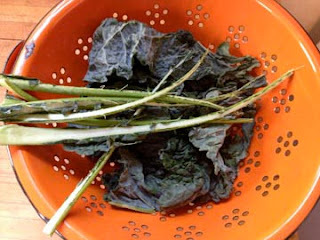 Add kale or other greens, toss until it starts to wilt. 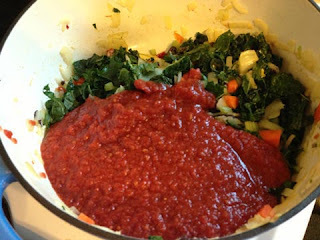 Add 6-8 cups of vegetable stock (you can use chicken or beef here) and 4 cups of crushed tomatoes. Stir. Add cannellini beans and herbs. Bring to a boil, then simmer for 40 minutes. (Optional) Add a handful of pasta if you're feeling it, but it's plenty hearty on its own. Boil until pasta is done and serve. I'm just starting out honestly, with "breakfast cake." I know there's a fine line between bread and cake - (banana bread and carrot cake?) and this is a non-dessert cake. It's not a bread. It's also not super sweet. 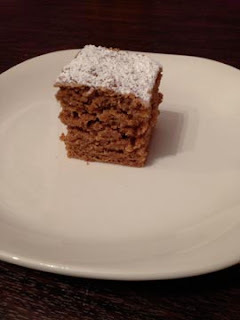 It's breakfast cake, but you can have it for dessert if you want. 2. When I was a teenager, there was this orchard/farm market by the mall and they made amazing applesauce cake. 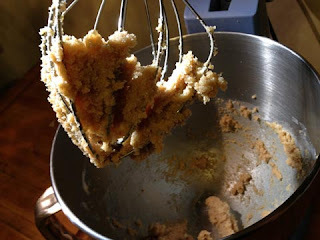 So working off the idea that cake can be made of applesauce - and not just in the swap-the-oil-for-applesauce-in-the-Duncan-Hines-mix-way - and that I needed to use some apples, I went to work. Except, it's hard for me with desserts. I don't like really sweet things. Also, I have no idea how that applesauce cake I grew up with was made. 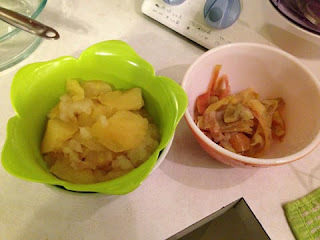 I used to make applesauce by simmering apples and pushing them through a fine sieve. It was tedious, but fairly direct. Apples, heat, sauce. 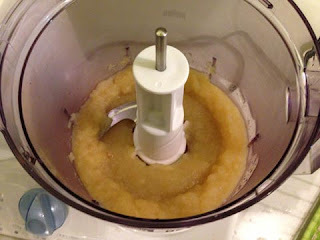 I am now the proud owner of a food processor, so it was much less time consuming, but I made applesauce all the time when I didn't have a food processor, so don't let that get in your way. This is what food mills are for, if you have one of those. I had four apples to start with. These were Fujis from Bird in Hand, PA. If I had five apples, that would be ok too. I wanted a cup and a half of sauce and came up just short. Apples were quartered, cored, and the skins were scored. Then dropped in near-boiling water (disregard the temperature in the photo). Simmer until soft, 20-30 minutes. Run under cool water and drain. Peel skins. Puree (or mill, or push through a sieve). I came up just shy of a cup and a half (that's a cup-and-a-half measuring cup). Apple size is going to vary. Preheat the oven to 350 and grease and flour a pan. Or just flour, you know your own pans. I went with a brownie pan. 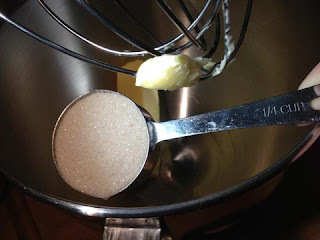 I took a stick of butter, a quarter cup sugar and a half cup brown sugar and creamed them together. I beat an egg into the mix, and added the applesauce. Since I was a bit short on sauce, I added some cider too. 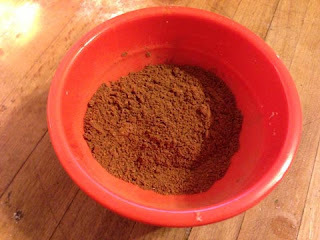 I sifted some flour (half whole wheat, half AP) with baking soda and spices (nutmeg, cinnamon, cloves). And slowly incorporated it into the wet ingredients, stirring gently. Once your dry goods are wet, it's go time. 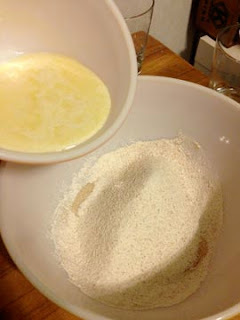 Spread the batter into your pan, and pop it in the oven. Set a timer for 30 minutes, but expect it'll take 45. After 30 minutes, do a toothpick test. You want it moist, but not raw. Let it cool, then turn it out and maybe very liberally apply powdered sugar, since it's really not a sweet cake on its own. With tea I'd call it breakfast, with milk I'd call it dessert. If I was all alone on the couch I might call it dinner. 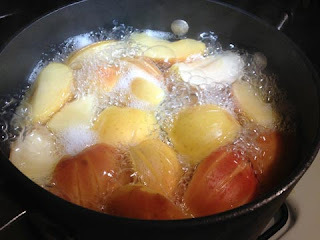 Core and quarter apples, and simmer until soft (20-30 mins). Peel and puree - either in a food processor, food mill, or through a fine mesh sieve. Or start with some applesauce and go right to step 2. 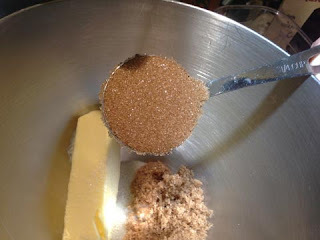 Cream butter and sugar together. Beat in egg. 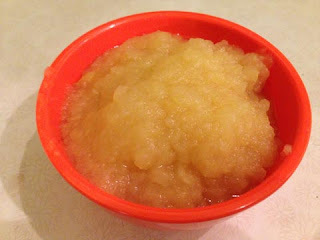 Mix in applesauce and optional apple cider. 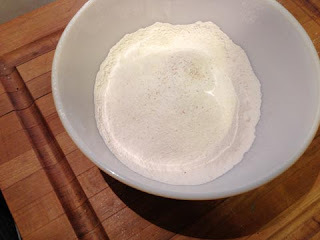 Sift dry ingredients (except the confectioners'/powdered sugar) together. 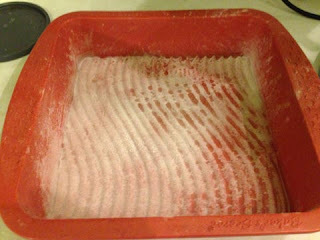 Sift again into wet ingredients. Fold in, stirring gently. 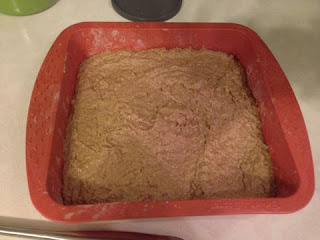 Spread mixture into a buttered and floured brownie pan. 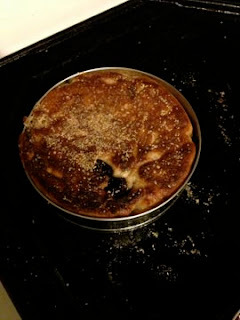 Bake at 350 for 30 min to 45, testing with a toothpick. 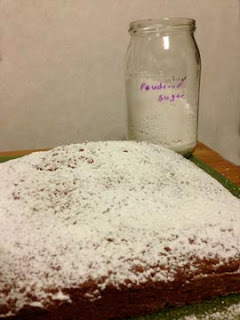 Let cool, turn out the cake and dust with confectioners' or powdered sugar.